Sarcastic. Short-tempered. Definitely not sparkly. Paramedic and firefighter Hugh Argent is no one’s idea of a unicorn, and he’s careful to keep it that way. His life depends on hiding his secrets…and on never meeting his true mate. Outcast. Unwanted. Untouchable. Wyvern shifter Ivy has been shunned her whole life due to her uncontrollably venomous skin. Now finally there’s someone who can touch her…and he doesn’t want anything to do with her. No matter how much Ivy craves to be touched at last, there’s one thing that can make her give up her only chance at love—a cure for her terminally ill younger sister. So Ivy offers Hugh a deal: Heal her sister, and she’ll get out of his life forever. The more Hugh gets to know Ivy, the more he longs to claim this brave, fierce, infuriating woman. But a unicorn can only take a mate at a terrible cost… More than hearts are at stake. And every secret is about to be revealed at last. Combining romance, action, and a generous helping of humor, Firefighter Unicorn will delight fans of TS Joyce, Terry Bolryder, and Sherrilyn Kenyon. All books in the Fire & Rescue Shifters series are standalone romances and can be read in any order. No cliffhangers! 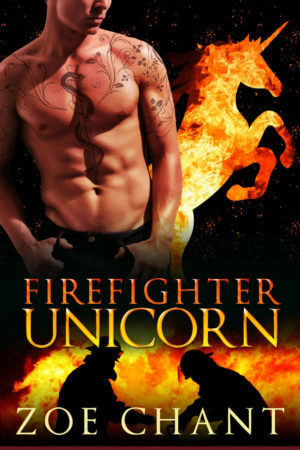 If you love intense paranormal romance with a sassy twist, pick up Firefighter Unicorn today!